Making sure your readers have no issues reading your text requires you to structure it. Especially larger pages should not be written as a massive block of text. 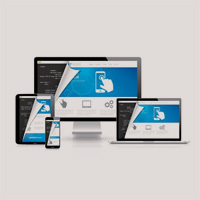 Structure it with paragraphs and split those into nicely readable chunks with HTML headings in between. 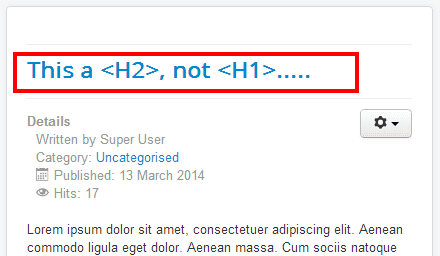 Ideally, the main heading should be an H1 (this is the <h1> element in your HTML) and subsequent headings H2's. If you need more hierarchy, you could even use H3's, but don't go deeper than that. In your Article Manager, go to the Options and set the parameter Show Title to No. This ensures that the title in the article is not shown at all. Instead, just start the content of every article with an <h1>. This may mean that you need to type the same title in both the Title field and in the editor window, but for smaller sites, this should not be too much trouble. There are a number of extensions that can be used to set your title tags correctly so that they force <h2> titles to become <h1>. One example is SH404SEF, which can auto-correct your main headings. But personally, I like to be in control, so I don't use these options. You will notice the <h2> tag. If you replace the opening and closing tag with an <h1> your titles will be shown correctly. 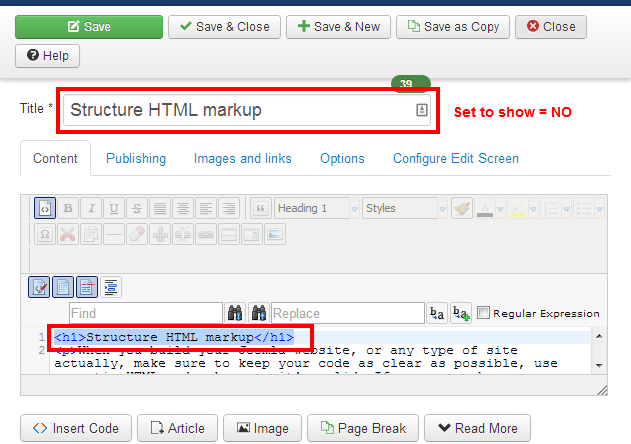 Note that you can achieve the same in Joomla 2.5 (which is also still possible in Joomla 3) by copying the file default.php located incomponents\com_content\views\article\tmpl to templates\YOUR_TEMPLATE\html\com_content\article (if needed, create the html and com_content folder in your template folder) and performing the same changes there. Note that this procedure may not work in all templates, as some template clubs maintain their own overrides, which may conflict with this procedure. After you have arranged an H1 on every page and also some H2's if needed, make sure to keep structuring your text. Usually, I do not go deeper than H3. For my module titles, I often use the H3 heading. Use <p> tags for the body text.